Hail and blessed be the hour and moment in which the Son of God was born of the most pure Virgin Mary, at midnight, in Bethlehem, in piercing cold. In that hour vouchsafe, O my God! to hear my prayer and grant my desires, through the merits of Our Saviour Jesus Christ, and of His Blessed Mother. Amen. O IMMACULATE Virgin! Mary, conceived without sin! Saints, where nothing defiled can enter. O Mary, conceived without sin, pray for us who have recourse to thee. LITANY OF THE BLESSED VIRGIN MARY Lord, have mercy. graciously hear us, O Lord! During Advent Let us pray. O God, Thou hast willed that, at the message of an Angel, Thy Word should take flesh in the womb of the Blessed Virgin Mary; grant to Thy suppliant people, that we, who believe her to be truly the Mother of God, may be helped by her intercession with Thee. Through the same Christ Our Lord. R. Amen. PROMISE: "All those who implore my help daily for nine consecutive days, from the 4th to the 12th of March included, and worthily receive the Sacraments of Penance and the Holy Eucharist on one of the nine days, will experience my protection and may hope with entire assurance to obtain from God any grace they ask for the good of their souls and the glory of God." The Father arose, instantly cured. So well has the Saint kept this promise that this devotion in his honor became universally known as the Novena of Grace. Its efficacy is not restricted to the dates mentioned. It may be made very appropriately from November 25 -December 3, the Feast of St. Francis Xavier. Though any prayers can be said in honor of the Saint, the following are generally recommended. 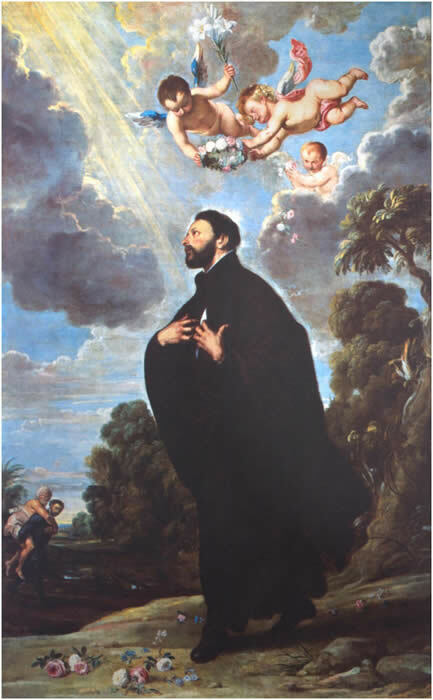 O Saint Francis Xavier, well beloved and full of charity, in union with thee I reverently adore the Majesty of God, and since I specially rejoice in the singular gifts of grace bestowed on thee in life, and of glory after death, I give thanks to God, and beg of thee, with all the affection of my heart, that by thy powerful intercession thou may obtain for me above all things the grace to live a holy life and die a holy death. Moreover, I beg of thee to obtain for me (mention your favor), but if what I ask does not tend to the glory of God and the greater good of my soul, do thou, I beseech thee, obtain for me what will more certainly attain these ends. Amen. Eternal God, Creator of all things, remember that Thou alone didst create the souls of infidels, framing them to Thy Own image and likeness; behold, O Lord! how, to Thy dishonor, Hell is daily replenished with them. Remember, O Lord! Thy Only Son, Jesus Christ, Who suffered for them, most bountifully shedding His Precious Blood: suffer not, O Lord Thy Son and our Lord to be any longer despised by infidels; but rather, being appeased by the entreaties and prayers of the elect, the Saints, and of the Church, the most blessed spouse of Thy Son, vouchsafe to be mindful of Thy mercy, and forgetting their idolatry and infidelity, cause them also to know Him Whom Thou didst send, Jesus Christ Thy Son, our Lord, Who is our health, life, and resurrection, through Whom we are freed and saved, to Whom be all glory forever.